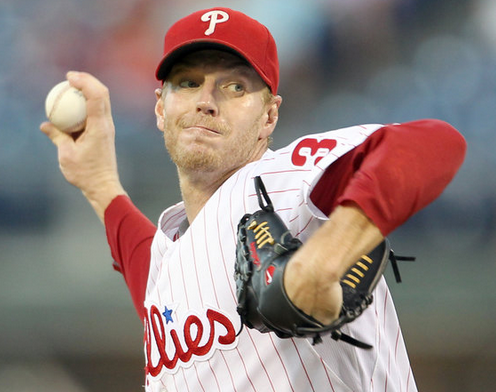 FACT: Roy Halladay had shoulder surgery this summer. FACT: Phillies pitchers not named Roy Halladay surrendered 13 runs in 21 innings against the Natinals this series. FACT: Roy Halladay surrendered one run in six innings against the Natinals this series. He also laid down a bunt that basically spurred the rally that landed our heroes their only runs of the game last night. You can't argue with facts, people, despite what the lazy, lame-stream media tries to tell you. Roy Halladay is best ever. "BUT ZWR WHAT WAS THE LINE? I NEED TO KNOW I NEED TO KNOW TELL ME ZEEE DUBBB ARRRR CAUSE I NEED TO KNOW!!!" Sure: 6 IP, 3 H, 1 R, 5 K (3C/2SC), 2 dorks PLUNK'D. Awesome, right? Would have had the win, too, if not for our super awesome bullpen. Ohwellz. "Halladay, however, magically limited the collateral damage"
Wasn't magic - it's because he's that good. Jeez!! The dorks had it comin' to 'em.